The Bubishido Monks are encouraged to keep a personal journal of their special training, especially the Five Core Teachings. The content of the personal journal is at the discretion of the student. The purpose of the journal is to act as guide towards greater self-reflection. Often, without recording our thoughts, we miss important lessons as the lesson at hand for that day may come in a fleeting manner and if not captured it may be lost. The journal provides a sacred space for the student to record their intimate thoughts about their overall progression in their physical and spiritual development. In this respect it can also be a place where important ideas and motivational quotes are recorded for further reflection. Essentially, anything that is important to the improvement of the spiritual nature of the training should be included in the journal. Today’s training started at 6:00 am after going to bed at 2 am. It seems that the body will not let me sleep any later and wants to get up as soon as 5 o’clock comes around no matter the amount of sleep. I suppose the regular early schedule is taking hold on the spirit. The morning was quite cold at -23c and so the dojo was chilly but the space heater quickly warmed it up and needed to be turned off after a short time. Elsewhere on these entries, I mentioned about students feeling a connection to their Sensei(s) and to the many Budoka who have gone before. Maintaining an open pathway to that connection and energy is an important part of a Budoka’s spiritual training. As important is keeping in mind your connection to your fellow Budoka, those with whom you have spent time in the dojo. Often, we take our dojo mates for granted as they are there each time that we practice, or we see them on a regular basis throughout the year. As older students, above the age of 50 will tell you, this will not always be the case. Life throws us a lot of curve balls, as they say. Life’s other responsibilities take over, people get married, children arrive, employment gets tough or changes, people return to higher education, and unfortunately some become ill and remove themselves from daily life. Naturally, all these things get in the way of continuous Budo training. Also, over the age of 50 an interesting perspective of life starts to take hold. You start to lose friends to illness or circumstances and you thus develop a greater appreciation for life itself. You start to have a very strong realization that our time on the earth is limited and we must use each and every day to our fullest, for even next week may never come. When one has the above appreciation it becomes almost impossible to waste precious time on frivolous things. As a Budoka this realization can have the effect to re-energize one’s practice and force a re-dedication to one’s Budo studies. This is the good that can come out of the bad of a lose of a dojo mate. For younger students we can also re-energize ourselves by keeping the memory of our earlier dojo days with our closest dojo mates at heart. It doesn’t only take lose for us to appreciate what we have. When practicing kata I often complete areas or sequences of moves that remind me of particular individuals with whom I practiced. Having watched my friends perform their katas and even having modeled some of my own movement from them, they tend to come to mind when I am reviewing the same kata(s) that they where also good at performing. This is a gift of training. In similar light to a strong memory being invoked by a smell, kata can invoke memories simply through the completion of movement. The above came to mind while practicing today as two different sequences reminded me of two different dojo mates I had during my early training days who I have not trained with in at least 20 years. What a joy to have them come back to mind in such a vivid recollection. For a moment it seemed that they were actually again in the dojo with me. And so this is the spiritual connection working its magic in your life. Your previous connections are being re-energized. In Quantum physics there is the belief that once two atoms form a connection through a collision they remain bound together at a faster than light connection so that they “know” the phase of the other atom. So, one can ask the important question that if this is possible for atoms should it not be possible for people or consciousness. I like to believe so. 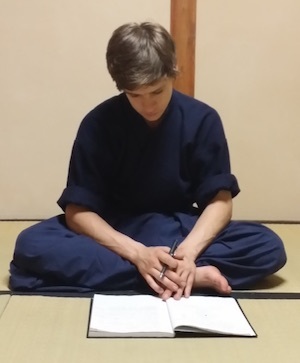 All Budoka should remain open to the mystical connections that form between individuals and draw strength from these connections in times of isolated training. This is a form of strength that all Budoka must learn to draw upon. Today’s training started at 5:10 am after going to bed at 2 am due to New Year’s festivities. Even with the lack of proper sleep training was good as the resolution for greater commitment towards training for 2017 was at hand. In the martial arts we have the terms “Shugyo” and “Ningen Shugyo”. Shugyo refers to “austere daily training” while Ningen Shugyo refers to intense personal study or training. We see with the two terms that there is a slight difference in whether or not the training is personally directed but we can also say that the terms are interrelated and cross over. The major point is that the training remains sincere and is why the word austere is often used. The term “austere” can refer to a few different concepts, being: strict, severe, no comfort, and simple in appearance. Often martial arts Shugyo training focuses solely on the severe side of the definition. And this is an error. Perhaps it has to do with the nature of martial arts or the type of personalities that are attracted to the martial arts. Whatever the case may be an undue focus on severe training can be detrimental and should be avoided. It can be detrimental because it sets the practitioner up for failure by design. It also sets the mind around the concept that something good or a preferred state of being can only result from pain and personal torture. And though this might have some basis or truth in the various mysticisms found in the world the approach is misplaced within the martial arts. The correct view of “Shugyo” should focus on the concepts of “no comfort” [i.e. : absence of luxury], “simple in appearance” and “strict” while keeping the “severe” training to a minimum. First, we must understand that we have to remove our ego from training if we truly wish to make personal gains, especially spiritual gains. By having an undue focus on overly intense, painful and severe training we are basically doing the exact opposite. When we train with a severe mindset we are placing our ego and all its baggage at the very center of our training. We set up a conflict between our present self and some future ideal that is based on passing through some form of torture. The entire process is based on pain and conflict. Ask yourself if anything truly beneficial can come of this. More likely than not the practitioner will at some point simply give up the sadomasochistic behavior and move on to other things. Otherwise said, it does not matter if the punishment being inflicted upon you is done so by an outside party or by yourself, it is still punishment. From a motivational theory standpoint we know that punishment can change behavior over the short-term but it does not have lasting long-term benefit and the chances that the old behavior (lack of daily training) will return is high. This is because the motivation is based on external forces. What we need in our personal daily training is reinforcement. Reinforcement can come from an external party, such as a Sensei, or internally from ourselves. It is preferred that the reinforcement comes from an internally generated source which is the point of this entry. By focusing our daily training around “no comfort”, “simple in appearance” and “strict” while leaving out the “severe” you remove your ego and any sense of punishment from your training regime. Your daily training will thus be internally generated and focused on the essentials. You will strive for simplicity in the execution of your techniques, you will exercise determination and be strict with your training schedule and finally you will develop a countenance of simplicity that others will appreciate. Simplicity can only be nurtured by removing baggage and stripping away the unnecessary. The thought that martial arts training has to be painful and severe is a Hollywood creation. Martial arts training needs to be dedicated, honest and sincere. It pushes the martial artist out of their comfort zone and encourages breakthroughs from a position of strength. If it is solely based on pain and severity it is ultimately a weak type of training and a true love for the martial arts, your Budo, can not develop. As a result you will always feel unfulfilled and unworthy. So, do not confuse pain and torture with true Budo training. Developing the character and spirit means developing a steadfast sense of determination, being strict with your schedule and plans and always approaching your training with a high level of sincerity that you are doing your very best. This is the way to finding a true love for Budo, a love and dedication that will be able to weather any storm. And this is the ultimate goal of Shugyo! Training started today at 6 am. I felt good and I can feel my body adjusting to the early morning timetable. Near completion of the 21st repetition of Sochin kata I decided to add an extra #22 and that next practice will be 25 and building onwards so that day 21 will be 40 katas in total in preparation for Teaching #3. It is important to always push yourself to getter heights in your training. Do not wait for your teacher or someone else to ask or suggest it, make a decision to grow. When I was studying my Master degree in The Netherlands the dutch teachers taught us many very valuable lessons. Dutch culture and society is relatively small but their culture has had a disproportionate effect on world history. They were masters of the seas and of commerce, one of the first hegemonies in the world. The dutch teachers taught me an invaluable lesson that “making a decision” is not the same as “taking a decision”. This might sound trifle at first until you notice in life and in business that many people make a whole host of decisions every day, but few of these same people put those decisions in to practice. Putting decisions in to practice (i.e. : taking a decision) is where the expertise and determination of the person comes in to play. Now, we may not always have the expertise we need to effectively put a decision in to practice. If you are young and you decide that you want to be a black belt then you have made a decision. But having the courage to go to a dojo or find a teacher and begin training is where the real test lies. Taking the decision and not merely making the decision is the key. But you must recognize that your skill set is lacking to effectively become a black belt. This is why your teacher or guide is there. The teacher, or Sensei, is there to help you to acquire the necessary skill set so that you can take your decision to be a black belt. But it is immensely important to understand that they can not take the decision for you. Only you can do that. They can only assist you once you have taken the decision and start to act. Often, I see students both in the martial arts and in academics falter and they often blame others for their failure. One of my Budo Sensei used to say that when you are looking for an excuse any excuse will do. And isn’t it so. Procrastination is one thing but insecurity is another. Procrastination often means that the person is lazy but not incapable. Insecurity often is at the root of the problem as to why many students make a decision but seem not able to take the decision. They are afraid of the consequences of not achieving their intended goal and so to avoid embarrassment they choose not to even start. This is bad thinking. So many inventors tried hundreds of times before their invention proved possible. The light bulb by Edison is one such well-known example. We must keep in mind the saying, “Touch the moon for reaching for the stars”. And the thought here is that by trying you will achieve. Even if you do not achieve your intended goal you will achieve something. And the benefit of that achievement might only show itself later in time. So make a decision for change, take that decision (put it into practice) and reach the moon through continuous improvement. All Budoka understand and appreciate the importance of not just making decisions but putting decisions into practice. Budoka are action-oriented individuals who provide example to the world of their determination for continual improvement through action. Kata is action-based meditation and self-development. Achieving the intended goal is secondary, cultivating an attitude of ceaseless self-improvement and continuous striving for greater personal development through action is really the important inner trait of every Budoka. Training started today at 5:10 am and finished at 6:30 am. Training went well and I felt strong. The focus of the exercise was keeping a steady pace. The dojo was very quiet. My thoughts turned to frugality and generosity and how the two go hand in hand. Being frugal doesn’t mean just saving money. It also means saving energy. Completing the kata when your body is tired teaches you frugality as you do not want to waste energy on useless movement. The more tired your body is the more this lesson becomes apparent. Training in general without wasting time and effort is important especially for teachers that need to make time for students. Making time for students is a type of generosity as we give our energy and time to the students. If we were not frugal with our own training we would not have the time nor the energy to help our students and thus a direct relationship exist. Budoka should remain aware of the necessity to think in a frugal manner so that resources in the form of time and energy can be shared for the benefit of others. Training is going well. I felt strong today despite also doing a core workout yesterday. I am in anticipation of the 40 kata for 40 day training as the next challenge and feel that I am in a good place physically, mentally and spiritually to start it after a short break when this 21 Day Teaching is completed. While I was a teacher in France at a private business school in Grenoble I had some students come up to me after class and mention that they had a difficult time concentrating for 1 hour on the lesson. I found this to be expected as they would constantly play with their phones or stare out the window. Since it was the last year of undergraduate most were 21 years of age. I asked one of them how they expected to work within a business if they can not concentrate for even short periods of time. I continued to mention that it often happens when you are in management that meetings can take hours. Three and four hour meetings are not unheard of. This memory came back to me today while training and it got me thinking about the nature of concentration. I too was a very happy-go-lucky 19 year old and when I went to college I had to teach myself how to study and how to learn as it was not adequately taught to us within the public high school system, or at least I was not open to learning the skills at the time. I was fortunate however. When I went to college there was a Karate dojo and I enrolled in the club which would take place twice a week at night after the regular hours of the school. I ended up taking a minimum of 6 to 8 hours a week away from studying in order to learn karate. This had a profound effect on me. The karate classes taught me how to focus. But more importantly the classes taught me how to learn. This is a lesson for all young people. We are not born with the necessary skill set to be a success at life. These need to be learned. The skills take practice. I am still learning about learning even as a Dean of a business school with Doctoral students. So, what we can say is that learning is important but learning how to learn and understanding that you do not have the skills to start off with and must acquire them is of paramount importance. And this realization or understanding is no one else’s responsibility other than your own. Multitasking, a fade from the digital world, is a known fallacy and it prevents proper learning and proper execution of tasks. Multitasking typically means that you do nothing very well. Proper learning as well as proper execution takes protracted concentration on one thing at a time. The brain needs that necessary time, focus and concentration to learn, remember and recall. And so we have kata practice and one of its major characteristics. Practicing kata must be done in time intervals of no less than 20 minutes. Five minutes of kata does no good. In fact, each kata should be completed a minimum of 12 times in order for the brain to consolidate the movement so that the next interval of training is cumulative. Otherwise, you just start back at the last or previous spot or worse you start again even farther behind. I have had junior students who have tried to learn the same kata for months on end. Their problem is concentration. They lose concentration after a few repetitions and then they waste time for the rest of the class. They do not practice outside of class. When they return they can hardly remember the opening moves of the kata. And they wonder why, even though the answer is staring them right in the face. Again, when we learn kata we not only are learning a sequence of movements for fighting purposes but we are training our minds to remain concentrated and to be able to work in a focused way for protracted periods of time. It must be understood that this is a type of training and it must be exercised. It does not come by itself, it doesn’t fall from the sky. One must first train 5 katas at a time, then work up to 7 katas at a time then on to 10, to 15 to 20 and so on. If the training is proper and prolonged then you have learned a transferable skill that can be applied to any domain in life: personal, academics, business or pleasure. The greater percentage of the population never learn this important lesson and are not able to concentrate their efforts for very long and is why most people falter and are not successes at their undertakings or projects. As Budoka we have the tools to learn how to be a success. All Budoka see the treasure in the study of kata and understand that it provides greater life skills that enable further personal development and success both within and outside of the martial arts. This morning was good. I started somewhat tired at 6 am but the energy increased as I trained and the 80 minutes went by quickly. During training I was thinking about sacred spaces. A sacred place is one where you can be with your thoughts and typically meditate away from the demands of the everyday world. A sacred space can be any place where you feel centered, secure and at home. We think of scared spaces like monasteries, libraries and temples. For many martial artists the dojo is that sacred place, however, it does not have to be so. O-Sensei Morihei Ueshiba of Aikido often admonished his students to practice outside. His feeling was that nature created a sacred environment where ever you were and so your Aikido practice would be infused with the natural rhythm and energy of the surroundings such as the forest. It is a good idea that we find a place that we make uniquely our own and one that can hold special meaning for us. A sacred space can be anywhere: under a tree, a room, an area next to the beach, wherever the surroundings speak to you and you feel that you are in communion with it. It should however be accessible to you so that you can take advantage of it at regular intervals, get comfortable with it and make it your own. Your sacred space might be one where you simply sit and think or it can be one where you train at your very hardest. Either way the sacred space is yours. Physically, the sacred place exist and is real, but spiritually the sacred place lives in side of you. When you experience your sacred space in the physical world, and it holds deep meaning, then you should be able to train yourself to go back to that spot in your mind’s eye when feeling pressured or stressed. A cottage next to a lake for example could be a sacred place for someone which they can easily conjure up in times of stress. They think of the placid lake and the singing birds and almost immediately their disposition changes. This is a psychological trick or meditation exercise that seekers use to help center themselves in the physical world. For some the sacred place does not even have to be a physically existing place and can be a wholly made up one, a place in the mind that is visited by only one. Keeping their sacred place or space available to them at all times, they are able to spiritually move themselves to that space in order to quiet their minds and regenerate their spirit. So when you see a Buddhist monk meditating in a crowd of people they are most likely visiting their inner sacred space: a place that they control, a place that is secure. All Budoka know the power of sacred spaces in helping to develop a solid foundation to their training. Find your sacred space and your Budo will take on even stronger meaning. There is a saying: “When the student is ready the teacher will appear”. And I suppose the converse is as valid, “When the teacher is ready the student will appear”. An important part of the martial arts, as in other parts of our life, is to find a good teacher, mentor or guide. I purposefully add the words mentor and guide as opposed to solely using the term teacher as the word teacher typically connotes a direct transmission of knowledge from a senior person to a junior. In the martial arts, as well as in life, the acquisition of knowledge, even when a teacher is present, is typically not a direct line. Moreover, teaching in a direct line is limited to tasks and root memory items. What we should be focused on is learning. A focus on learning shifts the subject of discussion from the traditionally all-important teacher to the learner. In the scenario where the focus is rightfully placed on the learner the teacher becomes less important. Or, perhaps a better way of saying it is that the teacher becomes more of a guide and not does not solely represent some body of knowledge that must be memorized. Of course, when teachers are acting more as guides they still hold a body of knowledge important to the student but the focus shifts from the direct transmission of that knowledge to a more subtle role: one of peaking the interest of the learner and to send them on a journey of discovery. As opposed to telling the student “Eat this!” the teacher shows the individual how interesting it is to learn how to cook and prepare the food for themselves. The shift in the focus from the teacher to the learner brings with it more responsibility to both the teacher-guide-mentor and student-learner. The teacher must learn how to guide and be a mentor and often this can be difficult as it means that the teacher-guide must get to know each learner as an individual. The teacher acting as guide and mentor has to find out what makes the student-learner tick and then must peak their interest in a sustained direction. As one can imagine, this is especially important when the student-learner is an adolescent and acquiring a love of discovery comes at a critically important time. Student-learners on the other hand also have an increased responsibility that is often overlooked. They must take responsibility for their own learning. They must learn to be inquisitive and they must develop a thirst for knowledge. This can happen in many different ways but suffice it to say that it must come from inside the learner. A good mentor-guide might be able to plant the seed but it is up to the student-learner to water it and watch it grow. The student-learner also has the important responsibility to stay open to the teacher-guide. It is important to find a good guide and mentor while you walk your path of personal development. It is even more important that you find a good guide when you embark on a journey of spiritual development. And this is where the consideration of the guide-mentor becomes critically important. Learners or seekers must be both accepting and critical of their mentors and guides. First, seekers must put their ego aside and allow the guide to appear. I know many students both in academics and martial arts who complain that there is a lack of good teachers while at the same time that very student is too full of their own importance to be able to listen to anyone. So, keeping the ego in check and allowing yourself as a student to listen, hear and absorb what a mentor is saying is an important lesson. Otherwise said, often the lesson is at hand but we are too occupied with our own selves to actually hear and understand the mentor. Interestingly, it is often when the learner starts to take on his or her own role as teacher-guide-mentor that this comes into greater focus. Secondly, the student-learner-seeker must be critical of the teacher-guide-mentor that his or her character is worthy of following. It must always be kept in mind that a teacher, mentor or guide is only human, they are not demigods. They are people similar to all other people and have good and bad moments. So some forgiveness towards the teacher for bad moods or off days is always required: the same as you would do for a parent or a friend. However, it should be understood that teachers can also loose their way and students need to be aware of this. A rule of thumb in the martial arts to ward against following a unworthy teacher or guide is whether or not that teacher is also on a learning path: are they training and learning on a daily basis. Notice that we did not say teaching path. All good teachers, true guides have their own insatiable desire for new knowledge. Students surrounding these teachers are thus energized by the desire for knowledge they see within the teacher and almost by osmosis start to emulate that behavior. This is teaching by example. It is truly a wonderful thing to be associated with a teacher who we know loves to learn. And so it is our responsibility as student-learners and seekers to find these special teachers, guides and mentors who can help to motivate us to attain new knowledge and become the very best examples of ourselves. All Budoka recognize their responsibility to work tirelessly on developing their own innate desire for true knowledge, they control their ego and seek a teacher, mentor and guide who is worthy of their energy and attention. I read an article yesterday that said that one of the well-known exercise trackers was the most downloaded app for the holiday season and thus many must have been sold. Fitness trackers can be a very good thing, especially if they help to motivate someone to get active or assist in monitoring critical measures such as pulse and blood pressure, etc. However, they can also become a blocker to your success as a spiritual athlete. As with all technology, the technology itself can be a good thing or a bad thing. Or, more precisely, the particular application of the technology may be a good thing or a bad thing. Looking at fitness trackers and the martial arts we have to keep in mind the saying by Einstein that “Not everything that counts can be counted, and not everything that can be counted counts.” The fitness tracker may be able to tell you how many calories you are burning, how many steps you have taken and how far you are from a prescribed physical goal but they do a poor job at helping you monitor the real significant items of your training. The tracker does not ask you if you are training with honesty and sincerity, it does not ask if you are facing your shortcomings, it doesn’t ask if you are being conscientious of your surroundings, maintaining proper stances or examining the positioning of your feet. It doesn’t ask you if you are being considerate of your fellow martial artist and contributing to the greater good of the Budo community. And it most certainly does not help you to know if you are moving towards a better spiritual understanding of your place within the greater whole. Keeping these limitations in mind and remembering that the martial arts is a combination of the physical, mental and spiritual we see that the application of exercise trackers is very limited to the point of making them almost useless. But they also have a more subversive effect in my opinion. They end up drowning you in the useless minutia of data points that detract from your intended focus on the higher purpose of your training. As a result, we end up constantly checking our pulse rate, step count, calorie burn and other metrics which simply occupy or minds and limit us from attaining a sense of concentration and meditation during our training. Suffice it to say that you do not need a tech gadget to tell you that if you execute your kata 21 or 40 times in a row you will burn calories. And moreover does the actual amount of calories that you burn really matter in the first place. Your body will give you the necessary feedback as to whether or not you are training diligently. As mentioned in an earlier post, the feeling you have as a result of your training when you complete mokuso at the closing will give you all the necessary “data” that you need. So, we see that the technology essentially removes us from our own natural rhythm. It separates us from our built-in feedback mechanism. It breaks the natural intimacy that we have with our own body. And this can only be a bad thing. It is similar to the larger application of technology within society that again has the potential of removing us from nature. Instead of removing us from the nature that surrounds us as a community (macro-level consideration) this wrist technology removes us from our inner nature (micro-level consideration). It is subversive in so far as it intimates that we, the owners of our bodies, are not complete enough to guide ourselves along our own path. It reiterates the tired message of corporate interests that we are in some fashion incomplete and need a product to make up for our missing piece. It plays on our fears and in a very subtle but very direct way tries to tell us that we are not able to develop without some outside aid. It subjugates our innate nature to an artificial one. This does a massive disservice to the individual and creates a further sense of alienation. So, the enlightened Budoka reflects on the dehumanization that is possible through the blind acceptance of any technology and thus uses all technology in a conscientious and purposeful way. The Budoka avoids getting confused or sidetracked from the real purpose of spiritual training by fads or gadgets. So put away the monitors, get down to serious business and make real progress towards your goal of spiritual development. Due to the demands of holiday season training started today at 4:30 am. It was finished at 6 am. The sky was a deep dark winter purple accentuated by grey clouds. It was very, very quite and the dojo was chilly. The outside temperature was -5C relatively mild for this time of year. There was no candle burning in the dojo today as I did not want to disturb the sense of natural quiet and since I was operating on little sleep I needed the winter chill to keep me sharp. Though it was dark, there was enough ambient light from outside streaming into the dojo that training was fine. Today’s lesson is connected to yesterday’s in a very interesting way. After finishing training yesterday, I was fortunate to see two red foxes running and playing near the forest by my house. The snow was falling and it was relatively warm outside, it was still early around 8 am and they seemed to be very happy going about their business. I stopped to take a picture of them and after each pause fiddling with my phone they seemed to get a bit farther away making the photo more and more difficult until they stood up and looked at me as if to say, “Enough fooling around time to get back to work” and they scurried off. They seemed to be in a mischievous mood. I found this experience very auspicious for a few reasons. First, it is not every day that you see two full grown red foxes running about seemingly without a care, especially in a snow filled field. Second, I thought that where there are two foxes there must be a family of foxes and this gave me a very satisfying feeling. But more so I truly felt blessed at the serendipity of the moment. For what seemed to be a fleeting moment that at the same time also felt to last quite long there were two foxes and myself communicating or corresponding with one another. I wondered if they were Kami trying to communicate something in particular to me. And it was this thought that resonated with me that even in the city or suburbs we can find nature showing its face, but we tend to turn ourselves off to it. I wondered about how many other early morning people might have seen the foxes and simply passed them moving towards their next errand without even a thought. Turning ourselves off to the myriad simplicity and beauty of nature, I feel, is an unintended consequence of modernity. We surround ourselves with artificiality so much so that when we are presented magical moments that reflect the beauty of nature we have difficulty recognizing them. It is unintended because I think we do not actually wish this for ourselves but it is a consequence of making our lives in the modern world filled with time clocks, mortgages and job responsibilities. Turning ourselves off to nature, whether intended or not, can cause all sorts of dysfunction and is why often the recipe for tranquility and peace is simply returning to nature, taking a walk in the snowy forest or listening to the sound of the crashing sea. 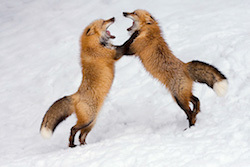 The red foxes gave me a simple gift that morning which provided a sense of happiness that remained through the day. Being conscious of keeping the pathways of communication within ourselves open to nature and its creation is a lesson that all Budoka must keep close at heart. Today’s training started with only 3.5 hours sleep. The body woke up early so instead of forcing sleep practice started at 5 am and was finished before 7 am. I enjoyed this change very much. While training, my mind moved to recent events of terrorism coupled with the thoughts of the possibility of peace. I remember hearing a well know spiritual teacher speaking and someone asked him “When will there be peace on Earth”. His reply was simple, “When people want peace.” And isn’t it that simple. His reply illustrated that people, representing the collective of human kind: our species, must be sincere in our quest for peace. When our species has gotten over our petty differences and learns to control the individual and collective ego then we will have peace, but not before. And it is the responsibility of each of us individually to work on this. No person from the outside can bring peace. Peace and love for the other starts inside. One must learn to truly love oneself and then one can embrace others. However, if we are constantly fighting ourselves, unhappy with our situation, blaming ourself and others, then we can never achieve peace. People have the habit of looking for external excuses instead of facing their internal shortcomings. So as martial artists we must understand this false process and face it head on, this takes honesty. We must understand clearly that peace and love for the other starts by working tirelessly on the self. Only by honestly facing our shortcomings and sincerely working on improving ourself first can we move closer to self-acceptance, inner peace, self-love and the ability to project that stability onto others. This is why for the Budoka self-improvement is a never ending challenge. One can always tell if the training of the day was successful simply by feeling the posture of Seiza during Mokuso. If you are jittery and feel yourself falling forward, backward or to the side it means that the training was not challenging enough. 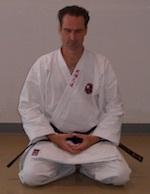 After the training is completed you should have a strong seiza position and feel very rooted in the sitting. Mediation after training should come easily. You should feel like you are sitting on an old comfortable sofa or chair. Your body will simply tell you if you have trained well. There is no hiding the truth. This is the feedback mechanism of Budo and is why meditation, especially after practice, is so important. I had the feeling today that there is nothing special about any day of training. That is, when you train everyday each day is the same as the other. The 1,000 day of training is the same as the 10th day. Unremarkable. Of course, there are all the different issues we face but training is training. Another thought which came to mind is that a student remarked that the 1,000 days of training was impossible. But when you think about when you were a child you would run outside every morning and spend hours with your friends exploring. No one ever said you had to do 1,000 days of exploring. You just loved to explore and to be with your friends playing. So maybe the issue is not that 1,000 mornings of training is possible or not possible, or hard or not hard, but rather that we do not love our training. If we truly loved our training 1,000 mornings in a row would be the accomplishment of a child. Today was a good day for training. A bit sore as core training also took place yesterday afternoon. Mentally was very strong and enjoyed the session. Motored through all the 21 kata rotations. Focused mostly on stances again. Learning to love Sochin Kata. Was thinking about the candle and how it can heat up an entire room. The dojo was cold today and lighting the candle had the dojo warm within a few minutes. It reminded me that no matter how small we think we are compared to the larger world we can burn hot and heat up the world with our presence. Today was especially tough starting as I also completed core training the day before and so the body was sore and tired. It seemed as if the katas passed very slowly, even though they always take the same amount of time. Mentally, I felt strong but was overly focused on getting to the last kata. When I arrived at the last kata being number 21 I had a sense of sadness as I did not want the morning training to end. During training I focused on the punching in Sochin and made sure that I was lowering myself enough. Tried an electronic candle (LED) but the artificial flickering was driving me crazy so I went back to a regular candle. The light is softer with the regular candle. It is -21c outside this morning and the dojo is very cold. It is difficult to get up because of the cold. I lit the candle to get some warmth. I completed the stretching and warm-ups with a focus on warming up. Once started everything went well. By the time I was finished the dojo windows were completely fogged-up from the heat of my breath on the cold exterior of the window. It makes me smile as I know I am training hard. It was very quite this morning because of the cold. Few people outside. Today the Gremlins were active. During Kata #12 I paused 3 times and thus redid the kata again with increased focus. Not sure if it was because of being tired or because of lazy mental focus. Either way persevered. I focused on keeping the back straight during the stances in Sochin. Trying to move as lightly as possible for increased control. Mental state was good except for #12 !!!!! !